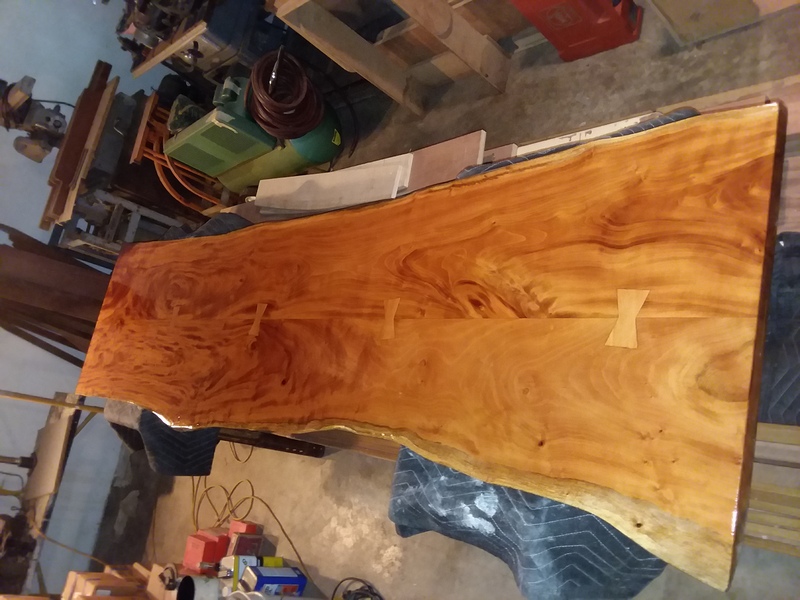 I am working on a project and purchased 2 bookmatched live edge slabs and am ready to glue the 2 halves togetherThis is for interior space. I typically use Titebond 1 for all my glue joints but was wondering if in this case I should use Titebond 3 or West System for better overall strength if the large slab halves have movement in the future. Any thoughts? Titebond I. You have had success with it. Typically joint failure shows the wood fails more than the glue so you won't have a stronger joint. Dominoes or dowels will help with accurate assembly and long term joint strength. I would only choose epoxy if I wasn't sure I would be able to apply enough clamping force to ensure a tight glue line necessary for PVA. This might be the case if you don't want to damage live edges with clamps. I agree with TB1 or Original. We run Original or Super by default. TB3 is about the worst glue we've used especially with regards to creep and joint movement. If your concerned with joint movement I would definitely go the domino or dowels route as Tom suggested. We use them a lot just to simplify the glue up. No fussing or worrying about alignment or shifting in the clamps. It may depend on the species of wood . There is not just 1 answer. If you have a proper joint with TB I then the glue will be stronger than the wood itself. TB I is the hardest most rigid of the TB line of PVA glues. I use TB II almost exclusively because of most of the advantages, longer open time, very water resistant and strong. The down side is it has a small amount of creep. I haven't heard many good things compared to bad things about TB III and I've never used it. D. Brown is correct in commenting that the wood species has a lot to do with glue choice. Assuming that this is a non-problematic species such as pine, maple, oak, cherry, walnut etc. then go with Regular Titebond (red cap......generically referred to as TB1). It cures to a harder, stronger than the wood itself glue line. TB2 would be my second choice only because the the potential creep. I've always use regular Titebond and TB2 as my regular adhesives until I get into more specialized situations. For these times I keep West System, Franklin urathane glue and Weldbond around. There are way to many complaints about the long term performance of TB3. I don't even keep it on the shelf. Your intitial question may have merit. The choices you offer are not really different. Titebond 1 & are rock hard, zero movement adhesives. Titebond 2 then 3 are softer when dry. Flexible is not a correct description. They do not allow any movement. Those two glues are known to slighted expand out of the joint indefinitely. If you are designing for movement you need something elastomeric. Basically adhesive caulk or silicone. Not the look you want. Your glue lines will not fail with the usual suspects. You may get checking in the field with large slabs. Not much you can do about it. I can honestly say that with production type work (read work that is glue line ripped in production, clamped, and then finish surfaced as a glued up blank) TB3 will absolutely yeild and allow movement, TB2 less so, and we have not dealt with it at all with Originial or Super. The caveat to that is of course one many not see any issue with TB3 in situations with precisely chosen and prepared stock but we no longer use TB3 for anything. If we need moisture/water resistance its urethane or epoxy. I should be the last person to say it, but don't overthink this. TBI would be the first choice. KISS, as I am constantly reminding myself. TB1 is excellent, no issues with creep or sanding gumming. With proper organization very few glue ups should take more time than TB1 allows. Recently did a bunch of glue-ups with resorcinol. Results were excellent if you don't mind the dark glue line but what a PIA to use. I didn't know how water resistant melamine glue was so we decided to do some tests. I know that when I've gotten it on my clothes it doesn't wash out, so thought it might be very water resistant. We tested Franklin's version. Glued maple, clamped, dried 2 days, into a 5 gallon bucket of room temp water. By the next morning it had failed! OTOH when a sample was cooked in a toaster oven, protected from direct radiation, it remained solid. I was surprised by both (totally unscientific) tests. I define movement as any movement whether its is the glue line itself or movement of pieces in the glue up adjacent to each other that are detectable visually, or by feel (usually by being able to catch your fingernails when dragging them across the joint. All of which we have experienced repeatedly with TB "ultimate". I agree with David and the other responses that as it pertains to the OP the K.I.S.S. rule is perfect. There is no real issue with open time and if movement of some thick live-edge slabs (even in long grain) is a concern a few dowels/dominos will be fine. There is a great thread in the archives here where one poster tested several glues in a maple lamination where the glue line is under constant stress in shear. TB 3 showed movement. Not of the glue expanding slightly indefinitely, but the laminations moving in relation to each other under the stress of springback. This shows clearly that as you state the glues are "softer" or more plastic than one would like in certain applications. I have no idea, and cant imagine, the glue line will move indefinitely as it would eventually fail. But none the less, I have seen and felt movement between adjacent boards with TB3 that we have never experienced with Original, super, or 1. Precisely selected, high quality, straight grained, precisely prepared material would likely never be an issue other than for the slightly expanding indefinitely over time part. The movement issue of any kind is the only reason its not in the shop any longer. I guess I'm not making myself clear. I have been one of the original nonbelievers in TB3. I voiced my negative opinion in discussions with David many years before he disavowed it his personal experience. I haven't used Titebond 2 since our 2nd bottle months after it came to market in the 1990's. Simply because of the creeping visible glue line issue. The water resistant nature is not good enough when you've got epoxy sitting on the shelf. Our shop has always been a TB1 & epoxy shop. I always try new adhesives and have never found any with merits except for poly(Gorilla type) for adhering dissimilar materials( rocks & wood). As it pertains to this thread. The amount of movement in TB3 compared to TB1 is negligible. It will only cause a minor cosmetic difference of a visible raised glue line. It will have zero benefit in regards to movement as the original poster asked. Apparently to gain waterproofing with pva glues they become increasingly soft. The mechanical properties do not improve. TB1, epoxy, and a high quality polyurethane adhesive caulk like Sikaflex or 3m 5200) have gotten us thru 30 years of work with almost zero failures. i fabricate a lot of 2 1/2 thick mahogany tops and exclusively i use dap/weldwood plastic resin. dependable, no creep, plenty of time , and easy cleanup. i disagree about creep with TB products.